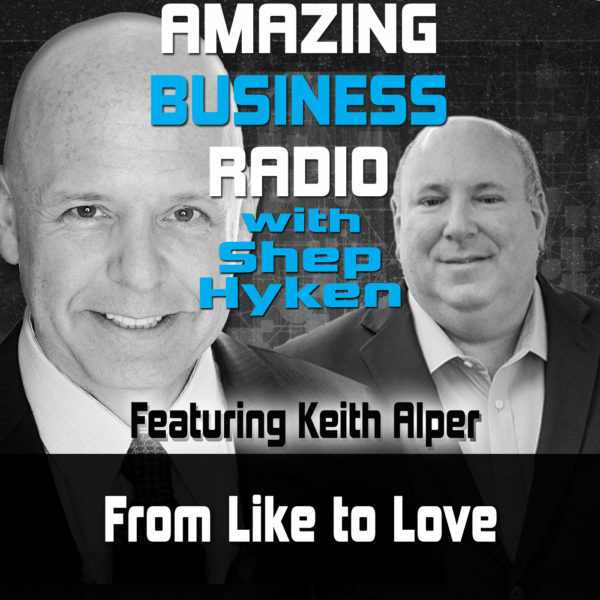 Shep Hyken sits down with Keith Alper to talk about his new book, From Like to Love. They discuss how to create a loving employee culture, the five basic needs of employees, and what millennials want in the workplace. Keith says that employees have five basic needs. Successful organizations with great employee engagement and culture share a lot of these five basic needs. As an employer, you genuinely care about me. I trust you and you trust me. You appreciate me for who I am and you tell me so. We share a meaningful purpose. Meeting your employees’ basic needs and creating a loving employee culture is a 24/7 commitment from the top all the way down through the organization. Millennials are collaborative and think in groups and tribes. Being able to view their peers in the workplace as a family is important and will move them from like to love. Since people spend most of their time at work, it’s not all about the money. They also care about sharing a meaningful purpose and making the world a better place. Ask your employees what they love and what they don’t love. Two of Keith’s employees at CPG (Keith’s company) said the maternity policy was outdated. Because of their great culture, they were comfortable enough to voice their concerns and a change was made in less than 48 hours. When someone comes to CPG’s office in St. Louis, Missouri, Keith wants them to be in love with what they experience on their visit. CPG puts their names up in lights, music plays, and there’s great food and gifts. Keith wants their clients to love CPG because they love them. Keith Alper is the CEO of CPG Agency, which specializes in corporate and employee engagement. Keith has over 30 years of expertise in marketing, communications, event production, entertainment, and strategic leadership. His book From Like To Love draws on real-life examples to present his proven process for turning any organization from appreciated to adored. What are the basic needs of employees? What do all successful organizations have in common? Why should companies give back to their communities? How can you involve employees in decision making?